It is clear from the quote above from the Second Vatican Council that in proclaiming the word of God, readers exercise their responsibility by mediating the presence of Christ. God speaks to the assembly through them; the reader has responsibility for not just simply reading the word, but assisting the assembly to hear it. 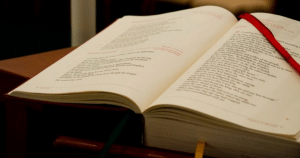 Readers should always be attentive to the assembly, and careful to allow for times of pause and silence as the assembly prepares to listen and, once the word has been proclaimed, as it takes the word of God to heart. The impact of God’s message will depend on the reader’s conviction, preparation, and delivery. Reverence toward the Scriptures is important; the Church sees an intimate link between “the table of God’s Word” and “the table of the Eucharist.” From the first, the divine covenant is announced and the Church grows in wisdom; from the other, the covenant is renewed and the Church grows in holiness. In exercising the ministry readers encounter a rich abundance and variety of style of readings. Each inspired author reflects upon the mystery of God’s presence and action in human history in their own style. The writings contained within Sacred Scripture use a wide arrange of literary styles to communicate the message of salvation. These range from narratives and the poetry of the psalms to prophetic oracles and parables; from theological expositions to apocalyptic visions. So readers are called to deepen their knowledge and understanding of Sacred Scripture to perform their ministry with sincere, genuine humility and service to both God and the people to whom he chooses to reveal himself. A model of ministry for readers is John the Baptist who had to decrease so that the Messiah could increase (cf. John 3:30). It also was said of him that, “He was not the light, but came to testify to the light” (John 1:8). Readers are called to serve the community and give faithful testimony to the Word; they must put aside personal agendas and needs. Who may become a Reader? An indication of the skills required of readers is given in the description above. All Saints welcomes readers from all sections of our parish both young and old, male and female, married and single, able and disabled. Adult Readers should be baptised, have made First Holy Communion and Confirmation (the latter two in the Catholic Church), be regularly participating in the life of and be in good standing within the parish. Young People are especially welcome to take part in the ministry of Reader and should be encouraged to do so after they have been confirmed. If you would like to register your interest to serve the community in this way, please contact the parish office or complete the form below.